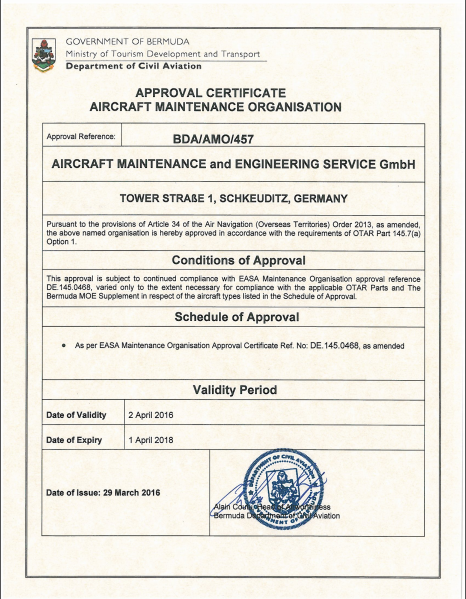 The certificate is issued by the European Aviation Safety Agency (EASA) and recognizes Volga-Dnepr Technics Moscow as an approved maintenance organization for maintenance activities on aircraft registered in the EU and other countries that recognize EASA requirements. 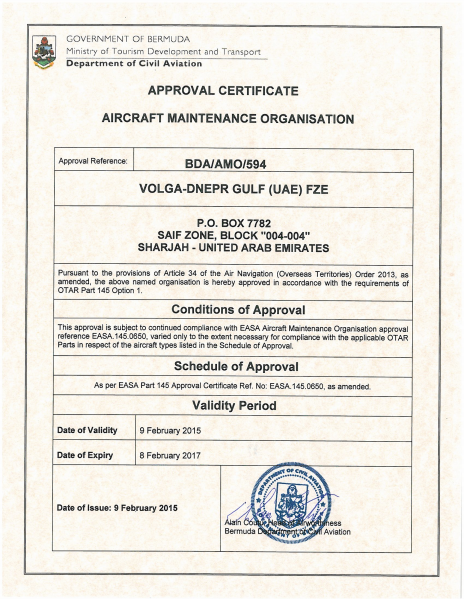 The certificate is issued by the Bermuda Department of Civil Aviation (BDCA) and confirms that Volga-Dnepr Technics Moscow is fully compliant with OTAR 145 and OTAR 43 requirements for aircraft maintenance organizations, particularly authorizing the company to perform maintenance on B747 aircraft with Bermuda registration. 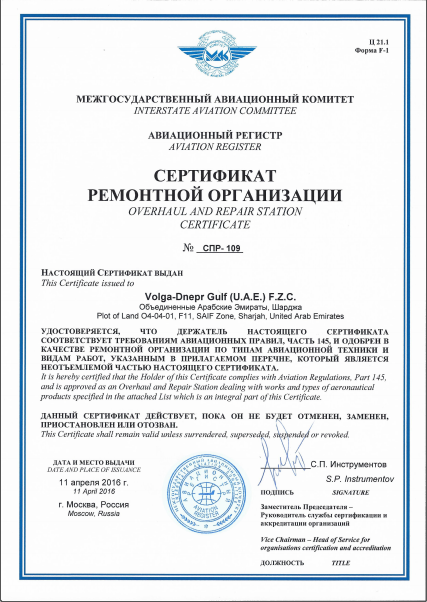 The certificate is issued by the Bermuda Department of Civil Aviation (BDCA) and confirms that Volga-Dnepr Technics Moscow is fully compliant with OTAR 39 requirements for aircraft maintenance organizations, particularly authorizing the company to perform maintenance on B747-400, B747-8, B737CL aircraft with Bermuda registration. EASA Part-147 Certificate granted by the European Aviation Safety Agency authorizes the Company to provide classroom and hands-on training of engineering and mechanical personnel for Boeing 747 and Boeing 737NG. The certificate is issued by the European Aviation Safety Agency (EASA) and recognizes AMTES GmbH in Germany as an approved maintenance organization for Boeing 747 and Boeing 737 line maintenance activities (up to A-check) at Leipzig Airport for aircraft registered in the EU and other countries that recognize EASA requirements. AMTES GmbH fully complies OTAR 145 requirements for Bermuda aviation authorities. 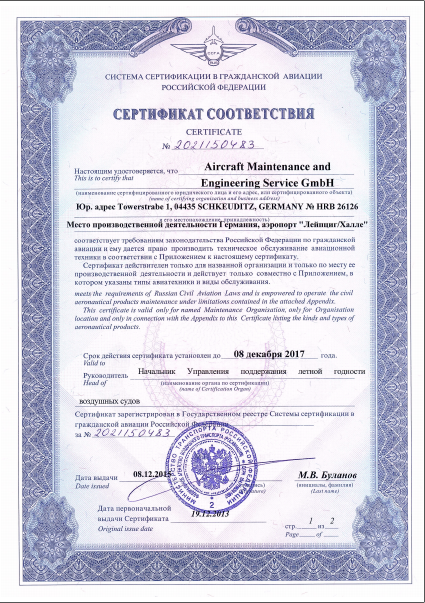 The certificate is issued by the Federal Air Transport Agency of Russia and confirms that AMTES GmbH in Germany meets the requirements of Russian civil aviation regulations and that the company is authorized to provide An-124, Il-76 maintenance services to Russian carriers. AMTES GmbH meet the requirements of the legislation of the Russian Federation in the field of civil aviation and the company has the right to produce aircraft maintenance in accordance with the requirements of the country of registration of the aircraft in accordance with the conditions set out in the certificates EASA Part-145 Approval & BDA/AMO/457 and existing audit manual. The certificate is issued by the Federal Aviation Administration of the United States and confirms that AMTES GmbH in Germany complies in all aspects with the requirements of the Federal Aviation Regulations. 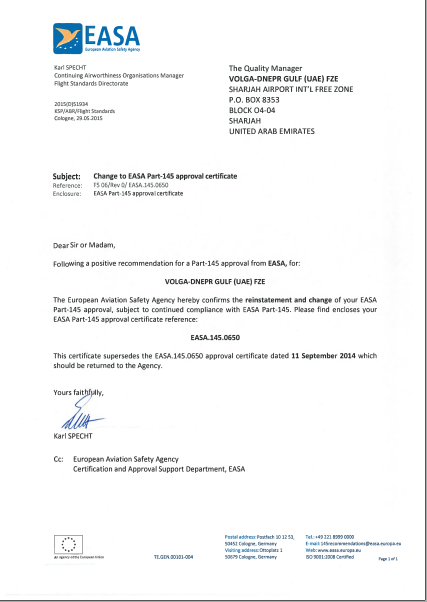 Certificate issued by the European Aviation Safety Agency (EASA), allows Volga-Dnepr Gulf perform line and base maintenance for aircraft type Airbus A320 Family, Boeing 747, Boeing 737, as well as components repairs and NDT. According to the requirements of the Bermuda aviation authorities "Volga-Dnepr Gafl" fully compliant OTAR 145 and 43 placed on the MRO organizations aircraft. The holder of this Certificate complies with Aviation Regulations, Part 145, and is approved as an Overhaul and Repair Station dealing with works and types of aeronautical products. Volga-Dnepr Gulf company is allowed to carry out aircraft maintenance type IL-76 and AN-124, as well as components repairs and NDT. 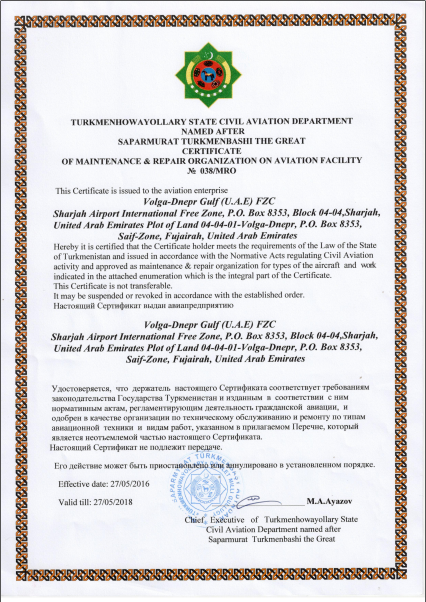 The Aeronautical Authorities of Turkmenistan Certificate for Volga-Dnepr Gulf until 2018. The holder of the certificate meets the requirements of the Law of the State of Turkmenistan and issued in accordance with Normative Acts regulating Civil Aviation activity and approved as maintenance & repair organization. The certificate is issued by the State Aviation Administration of Ukraine and authorizes the company to perform approved maintenance activities on aircraft registered in this country.